New Delhi: A high-level dialogue on India-China relations was held at, Manesar (Gurgaon), which was attended by over 30 senior practitioners and academics from the two countries this week. The two-day informal dialogue examined India-China relations in a changing global context and explored further development of bilateral economic engagement. It reviewed the search for a boundary settlement and management of borders and discussed enlargement of India-China cooperation in defence and security domains. The dialogue also reviewed the growing role of India and China in the world. These candid talks were assessed to be productive and forward-looking by both sides. The dialogue was held under the aegis of “The Sunday Guardian Foundation for Global Policy”, the Institute of Chinese Studies, Delhi, and China Centre for South Asian Studies, Sichuan University, Chengdu, with the support of China Study Centre, Manipal Academy of Higher Education, Manipal. The Indian contingent to these consultations was led by Ambassador Shivshankar Menon, Chairman, Advisory Board, Institute of Chinese Studies and former National Security Adviser and Special Representative for India-China Boundary Question (Special Representative), while the Chinese side was headed by former State Councillor and Special Representative Dai Bingguo. Ambassador Menon and State Councillor Dai delivered the keynote addresses at the inaugural session on 25 March, which was also addressed by Ambassador of China to India, Luo Zhaohui. 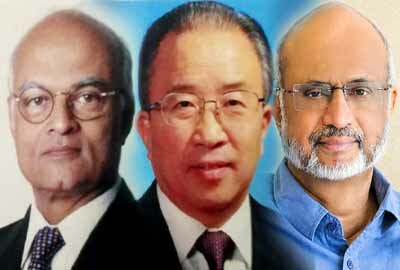 Former Foreign Secretary and Prime Minister’s Special Envoy Shyam Saran and Dr Qiu Yuanping, Standing Committee Member of the Chinese People’s Political Consultative Conference and former State Council Minister and Prof Madhav Nalapat, UNESCO Peace Chair, Professor of geopolitics at Manipal Academy of Higher Education and Editorial Director of The Sunday Guardian, also spoke during the session. Ambassador Ashok K. Kantha, Director, Institute of Chinese Studies and Prof Yan Shijing, Secretary General, China Center for South Asian Studies, Sichuan University, agreed that these informal high-level discussions will continue, with the next meeting taking place in China. It may be recalled that similar consultations were earlier held at Meishan, Chengdu, China in November 2017. Encouraged by the success of the latest dialogue, the two sides have now agreed to institutionalise it. The next round will be hosted by the Chinese side in China. The Institute of Chinese Studies (ICS) is one of the oldest research institutions on China and East Asia in India. With support from the Ministry of External Affairs, Government of India, it is the mandate of the ICS to develop a strategic vision for India’s dealings with China.